Trnavské Mýto is for sure one of the most intensive traffic junctions in Bratislava. This situation will even be amplified by the planned construction of an underground railway station and by extensive construction activities in the location (Filiálka, Slovany, Centrál etc.). On the other hand, the Trnavské Mýto environment does not provide the urban qualities and activities required by such intensive public life. The former Dom Odborov – Istropolis building is split among many small businesses and its cinemas are operated very rarely. The Nová Tržnica market surroundings are fragmented and its entrance is separated from the pedestrian movement level. If we include the “traditional” problem relating to the devastated subway, its no wonder that Trnavské Mýto has been a thorn in the sides of Bratislava citizens for a long time. 1 Intensive input on the whole spectrum of facilities supporting the urban character of the environment (shops, services), their development around the square and their mutual interaction. This solution represents a barrier from the busy crossroad and the exterior premises expand towards the square (terraces of coffee shops, restaurants and so on). 2 Enhancement/reprogramming of the existing functions. Recovering the marketplace surround- ings by expanding its premises towards a newly created diverging surface and transforming the currently disabled and half-empty Istropolis torso into a building offering social and cultural uses are particularly emphasized. 3 Blocking the disturbing effects of intensive traffic by lifting the terrain up to the level of the marketplace entrance on both sides of the road. The work with terrain clearly defines contours of the square in front of the Istropolis and ensures cover for public transportation bus stops. 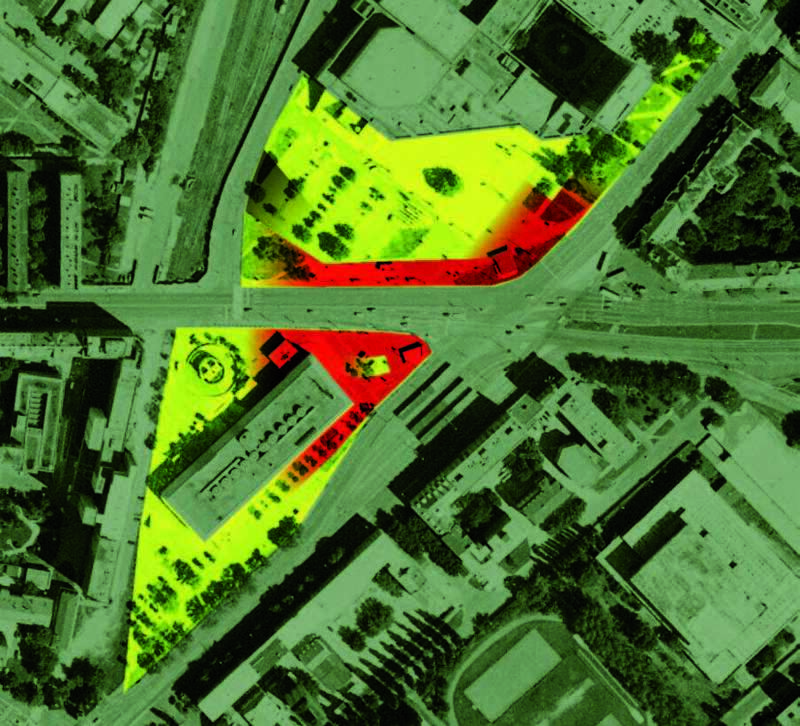 4 The importance of Trnavské Mýto should be supported by a mixed administrative and hotels pattern tracing the crossroad’s shape and bordering the square on its south side. However, a certain transmission range shall be kept in order to avoid disconnecting both parts of the Mýto. 5 Our proposed solution also considers a com- plex revitalization of communication structures, the subway and its direct connection to the under- ground railway station. The parking space, which had been removed from the Istropolis forefront, shall be moved under the terrain level. The south part of square premises should be used as a diverging surface for the exit from the railway station as well as for guests of the exterior facilities. The north part provides a diverging surface for the Istropolis as such and premises for open air social-cultural events (shows, exhibitions, theatre performances, art festivals and so on). The cascad- ing terrain arrangements on the east side of the square can be used as an auditorium for the above mentioned events. Various attractions and zones (a fountain, green islands, a “pool“ for skateboarders and so on) are placed in the forefront supporting the plurality of the square and the number of its various situations and uses.